Over the last few days, the new Ferrari Trento advertising campaign called “The Italian Tag” has hit the pages of the most important newspapers and magazines. With its contemporary take on deeply Italian values and symbols, the campaign is the product of the partnership between Ferrari winery and Armando Testa, a major player of the advertising creative industry. The multi-subject campaign shines a new, modern light on the joy of experiencing and sharing the Italian lifestyle and elegance to the fullest, also on social media. Ferrari’s bubbles are the true stars and social enablers of every story featured in the campaign: each event enjoyed and tagged with Ferrari turns into an unforgettable event. 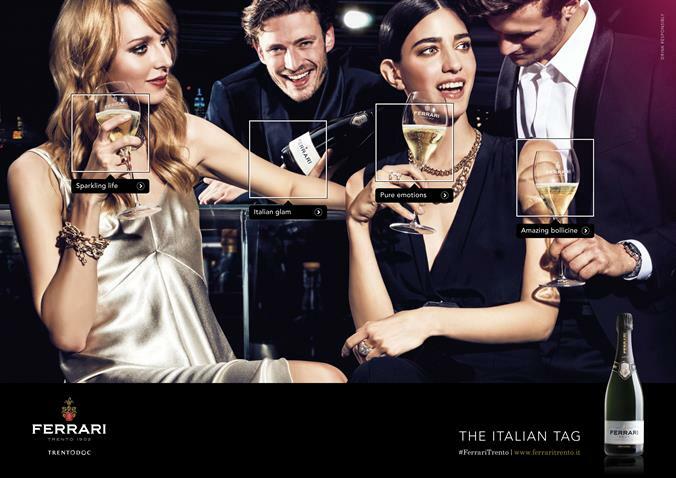 The name itself – “The Italian tag” – has a twofold meaning: Ferrari Trentodoc represents the Italian label (or tag) par excellence and, at the same time, it suggests it can be used as a tag on social networks to share any enjoyable and festive event. The campaign targets an open and dynamic audience that understands and values the multifaceted language of photography and the instantaneity of the digital world. The creative team led by Armando Testa has perfectly blended the soul of these two concepts to fully depict the special Italian Art of Living that Ferrari Winery conveys with its bubbles.